(Left) 0 Series EMU, the pioneer of Shinkansen. The last remaining trainsets were regrettably withdrawn in 2008. Photo at Tokyo in Dec, 1986. (right) 922 type EMU Shinkansen track inspection trainsets. Due to it's colour, acquired a nickname of "Docktor Yellow". Photo at Tokyo in Dec, 1986. (Left) 0 Series EMU Shinkansen on the Super Limited Express the "Hikari" passing through Atami. Photo in Jan, 1987. (right) 100 series EMU Shinkansen run at full speed besides Mt.Fuji. Photo at Shin-Fuji/Shizuoka in Jan, 1994. (left) 485 series EMU class300 on the Limited Express the "Hitach" passing by famous Kairaku-en Park. Photo at Akatsuka/Mito in Mar, 1988. 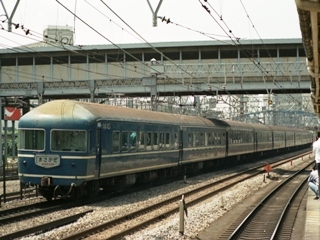 (right) 381 series EMU, passive tilting trainsets, on the Limited Express the "Yakumo" Photo at Bitchu-Kojiro/Nunohara in Mar, 1992. (right) Kiha-181 Series DMU in the Limited Express the "Hakuto". Filmed at Chizu in Feb, 1997. (Left) 781 Series EMU, on the Limited Express the "Lilac" , was specially introduced for Hokkaido area. Photo at Sapporo in Aug, 1988. (right) The Limited Express the "Asama" got assistance of EF63 type Engines. Photo at Karuizawa/Yokokawa in May, 1992. (Left) 183 Series EMU, on the Limited Express the "Toki", revival train. Photo at Tsukuda-Iwamoto in Oct, 2001. (right) 185 Series EMU on the Limited Express the "Odoriko". Slant Stripes were impressive. Photo at Nebukawa in Aug, 1988. 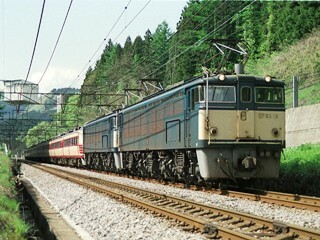 (Left) Kiha-82 series DMU on the Limited Express the "Hida", revival train. Photo at Joro/Hida-Miyada in Oct, 1994. 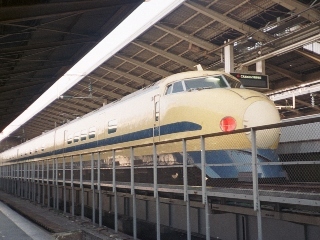 (right) The Limited Express the "Hamakaze". 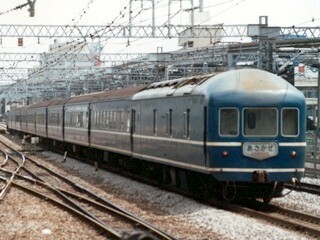 Kiha-181 series DMU is the enforced type of Kiha 82 series DMU. Photo at Kutani in Mar, 1992. (Left) 583 series EMU on the Limited Express Sleeping car train the "Hakutsuru" passing the bridge over the Tone river. Photo at Koga/Kurihashi in Feb, 1987. (right) The interior of 583 series EMU. Photo in Mar, 1994. 20 series passenger car on the Limited Express Sleeping car train the "Asakaze" #81. Photo at Tamachi in May, 1988. (Left) The Limited Express Sleeping car train the "Yuzuru". Photo at Mito in Feb, 1988. 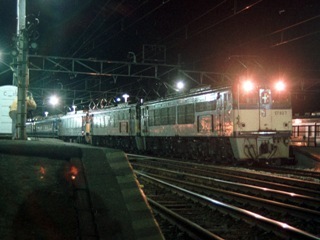 (right) The Limited Express Sleeping car train the "Hayabusa". Photo at Okitsu-Yui in Jun, 1993. (Left) The Limited Express Sleeping car train the "Izumo", about to arrive at Tokyo terminal. Photo at Tamachi in Aug, 1988. (right) The Limited Express Sleeping car train the "Izumo", crossing Amarube Bridge. Photo at Yoroi-Amarube in Mar, 1992. 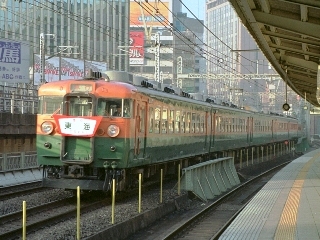 (left) 165 series EMU on the special revival train the Express the "Sado" arrival to Ueno Station. Filmed in Dec, 1997. (right) Kiha-58 series DMU, on the special train for "Kaze no bon" festival in Toyama, Japan. Filmed at Etchu-Yatsuo in Sep, 2000. (Left) 165 series EMU on the Express "Tokai". Photo at Chigasaki in Apr, 1988. (right) Train name plate was put just before the retirement. Photo at Yurakucho in Mar, 1996. (Left) 455 series dual voltage and AC/DC convertible EMU for express train at the left, and 719 series EMU for sururban service modified from 583 series EMU at the right. Photo at Sendai in Aug, 1988. (right) 165 Series EMU on the Express "Fujikawa" in rice fields. Photo at Shibakawa in Jun 1993. (Left) Kiha-58 series DMU the Express the "Tamba". Photo at Tango-Kanzaki in Oct, 1994. (right) Kiha-58 series DMU the Express the "Sakyu". 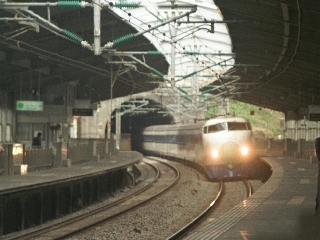 Photo at Tsuyama/Higashi-Tsuyama in Mar 1992. (Left) The Night Express the "Taisetsu". Photo at Sapporo in Aug, 1988. 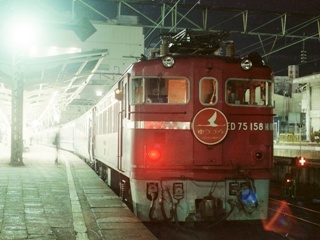 (right) The Night Express the "Noto" with triple engines. Photo at Yokokawa in Mar 1993.